Home » Blog » Comments » Featured Articles » History » London » UK » Camden Today in Old London Town. Camden Today in Old London Town. One day, you might find yourself visiting the London Zoo at the top end of Regents Park. When you have finished there, leave by the adjacent northern exit, turn right onto Albert Road and go down the steps to find the Regents Canal path. The walk along it can be spectacular and serene. It will take you past many beautifully decorated river barges moored in the shadow of a number of staggeringly valuable London properties. After about a quarter of a mile you go up the hill again and arrive in Camden Market. This is just about the most energetic and cosmopolitan venue in all of London town. The unchanging culture is for everybody and perhaps will remind you of earlier times in your life. 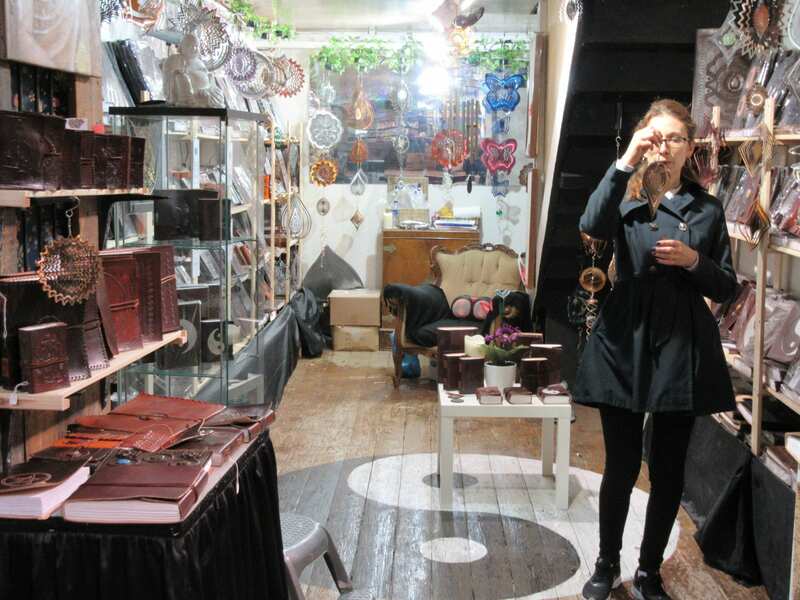 The market these days has spread over much of Camden Town but essentially exists as three distinct features. 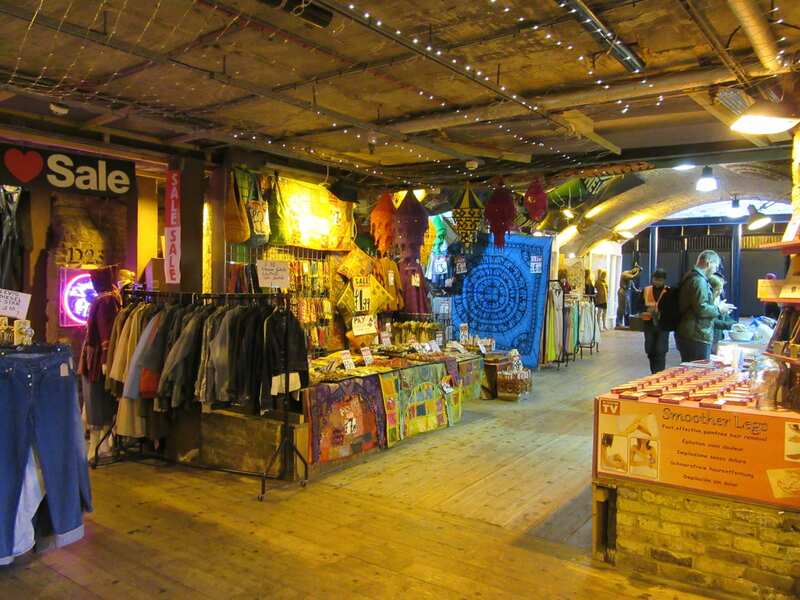 There is the Camden Lock market, the Pickfords Stables market and a later area that has spread widely into the surrounding streets. 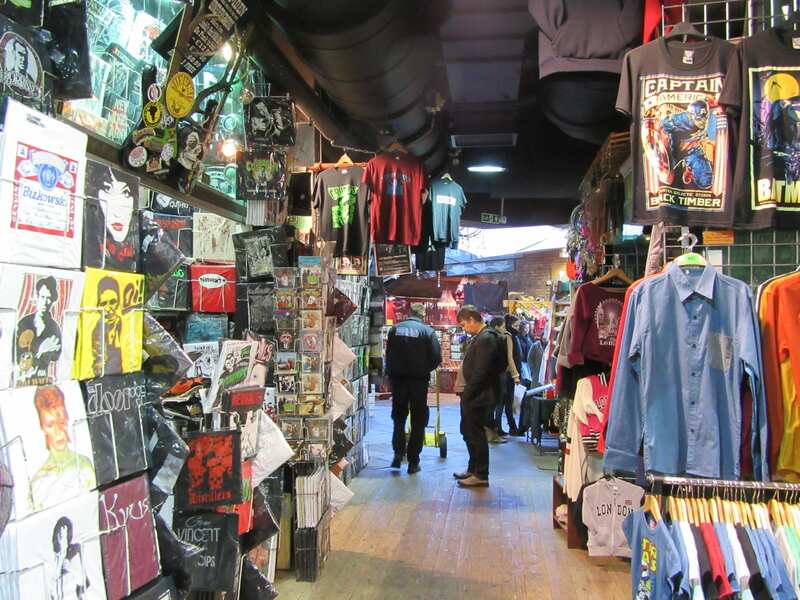 The markets have generally all fused together into a sort of London sub-culture. 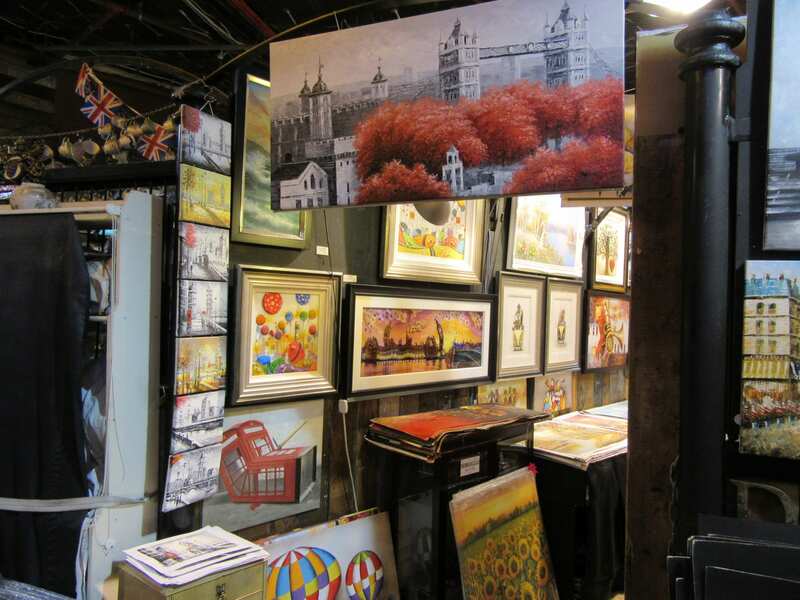 The Lock and Stables markets sell a vast range of the most eclectic and second hand goods that you could imagine. The remaining areas deal in inexpensive clothes, both new and pre-worn, and will always reflect a particular brand of London fashion inspiration. Wayne and Gerardine Hemingway set up a tiny stall in 1982 to sell their own property. They were broke and flogged the entire contents of their wardrobe in Camden market to make a few bob. Over thirty years, their foundling business mushroomed into sixteen stalls in both London and Manchester and reportedly have made them millionaires. They call their company Red or Dead and it sells the most up to the second fashion ideas. Red or Dead is internationally famous for its origins that came from Camden. The core of the market, built around the canal lock and the old Pickford’s horse stables, houses a myriad of stalls. Everything from household and personal objects to artworks, old typewriters and so many other treasured items from previous decades are up for sale. Sort through the piles of dusty old books and you will certainly find the one that you always wanted for Christmas as a child. 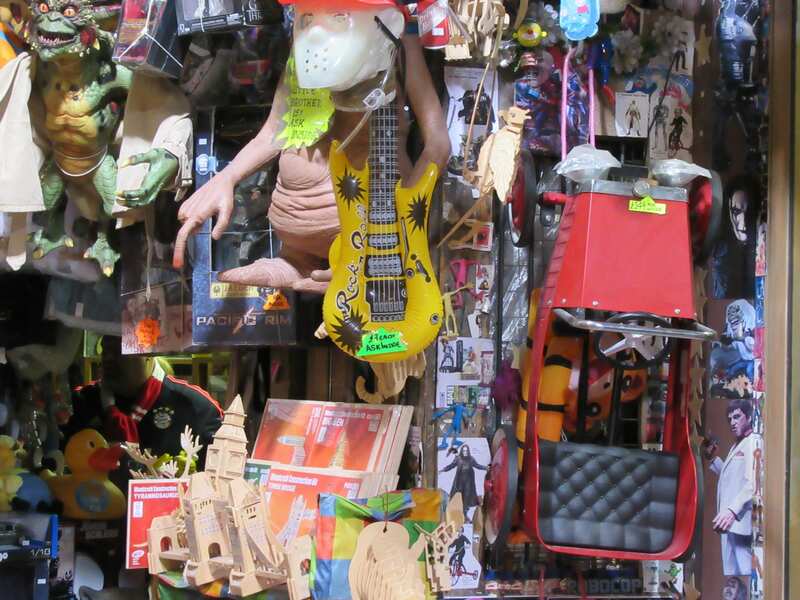 There are stalls selling metal toys, home-made jewellery, leather goods and just about everything else under the sun. 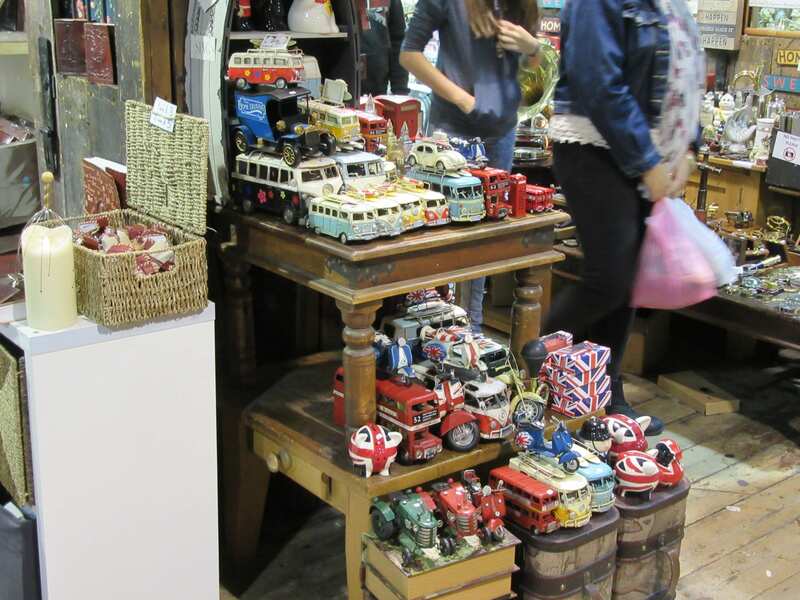 The market is always awash with people browsing the highly colourful array of the most varied goods and trinkets. Don’t expect to find a bargain though; the traders are savvy and will always wring the best price from the purchaser. But you never know your luck in Camden. Perhaps just once in a while, with an expert eye, you might find you can get even with them. There are also many stands selling exotic, mostly Asian, hot food. The aroma contributes much to the culture of the market. The food looks and smells delicious. It is probably best to woof it down quickly and not wonder too much about what the man from health and safety would say about it in the enclosed market quarter. Dining at Camden market can be one of those special London experiences. Along the streets of Camden Town there are many public houses. Every day they are full of people of so many nationalities drinking London beer and taking their lunch. The bars are always crowded and the staff are rushed off their feet. Camden always seems to support a vibrant economic process that freewheels all by itself away from the real world outside. Music hailing from previous decades is always being played. It contributes to the cacophony of the loud and continuous conversation from the cosmopolitan patronage. Amy Winehouse was a resident of Camden and she became such a famous component of the local culture. I always thought she was such a uniquely talented singer and I was a great fan of her. When I suddenly heard of her death one afternoon on the radio, I was literally shocked. Amy’s favourite pub in Camden was the Hawley Arms. She was a regular visitor there and everyone knew her. I visited that bar recently and there was hardly a trace of her previous patronage. You could see just a scruffy sort of puppet that looked a little like her on the top shelf behind some dusty glasses. The music being played in the pub did not feature any of her records and life went on as though she had never existed. The world continues to go round all by itself and even the most famous seem to quickly disappear into the ether. I felt rather sad for her. You can see some unusual things on the streets of Camden. There are live bands playing music occasionally that seems to reflect a previous generation. The previous generation really is high fashion in Camden. There was a man recently standing by a bridge who, quite un-self consciously, was performing British bird song impressions. The watching crowd often gasped and laughed at the accuracy of the sounds. Nobody seemed to be giving him any money though but he didn’t seem to mind. As you wander through Camden, keep a hand on your wallet pocket. There is quite a bit of street crime and perhaps best to use a cashpoint machine elsewhere just to be on the safe side. Leave via the canal path again and take the signpost to Primrose Hill, right next door. Primrose Hill really is the other side of London life. Many of the rich and famous live there and provide a different form of glamour all of their own distinctive style. Walk to the top of the hill if you can manage it and admire the extraordinary view of London City spread beyond you to the south. The hill top will be very familiar. It has featured in so many films featuring the most famous stars over the years. People from all over Europe and the much wider world come to visit Camden. They want to browse the markets and to see for themselves the energy and mix of people from all over the planet on the streets. 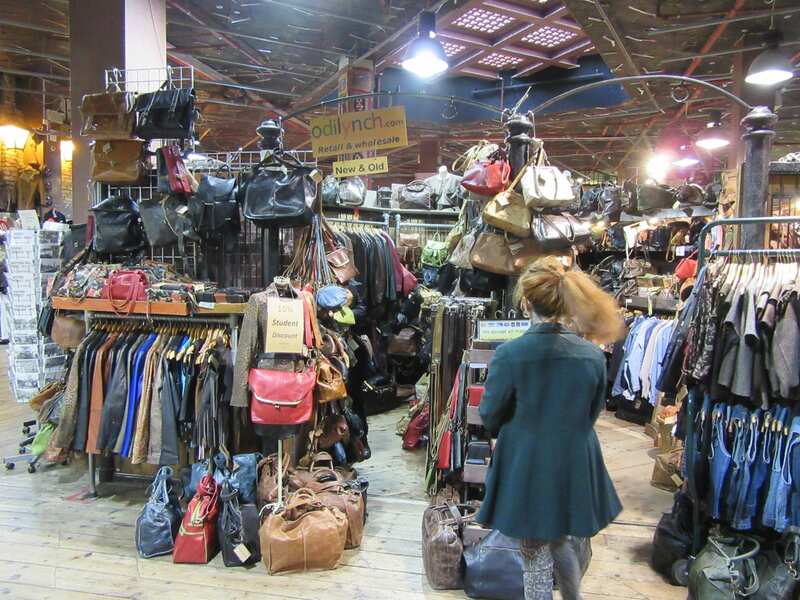 Camden Market is open every day but is always busiest at the weekends. There are around 100,000 visitors each Sunday and they fill the local economy to the bootstraps. See if you can join them sometime but remember to polish your ‘streetcred’ before you go. Ecology has High Status in Montreuil sur Mer. Paris from a Cycle Saddle. The Bluster of Berck sur Mer in the Winter. Fen Tigers on the Drainage Prowl. Mathematical Cambridge. First the Bridge, Now the Station. The Secret Vineyard of Paris.